Samsung Display recently confirmed that it is still developing large-sized OLED panels, and a couple of weeks ago it was reported that Samsung is discussing a large investment (around $3 billion US) into a new OLED TV panel fab. 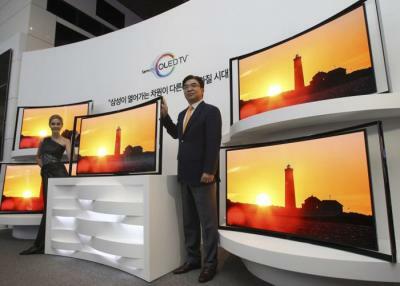 New reports from Korea gives more details about Samsung's OLED TV plans. Samsung is actually considering a slightly larger investment - around $3.3 billion in a new fab, with an aim to enable Samsung Electronics to launch OLED TVs by 2018. 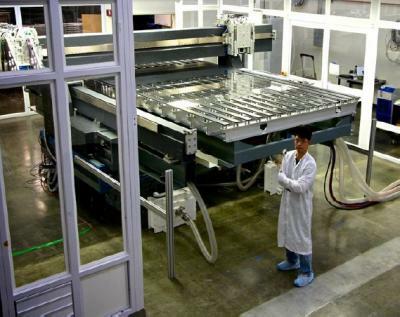 Samsung is looking to build a Gen-8 (2200x2500 mm, or six 55" panels) fab - and will need to start ordering equipment soon. The new fab will enable Samsung to produce about 495,000 square meters in 2017 (7,500 monthly substrates) and over 2 million square meters in 2018. The two reports from Korea differ in the kind of technology used by Samsung. PulseNews suggests that Samsung aims to use a direct-emission architecture, as it sees several disadvantages in LG's WOLED panels - in lifetime and burn-in problems (which will also appear in direct-emission panels, though, so this is somewhat confusing). ETNews has a more interesting report, in which they say that Samsung is considering a hybrid production method that will combine CVD (vacuum deposition) and ink-jet printing. This will enable Samsung to lower costs and achieve high yields. Samsung is looking into CVD deposition equipment from Applied Materials (probably for the IGZO backplane) and an inkjet printing system from Kateeva. Samsung is also considering using a white OLED with color filters, similar to LG's architecture. LG's WRGB technology (developed originally by Kodak) enabled the company to achieve high yields and scale-up production. Samsung has been considering a WOLED+CF architecture for a long time, and it will be very interesting to see whether Samsung has to license LG's technology for such panels or develop a different technology by itself. In any case, Samsung is expected to make its decision soon - at around May. It will need catch-up with LG Display, which plans to produce over a million OLED TV panels in 2016 and also announced ambitious production expansion plans with investments totaling over $9 billion. Samsung is investing heavily in increasing its small/medium and flexible OLED production so it cannot allocate a very large investment into OLED TVs at this stage. Will Samsung adopt LG's WRGB OLED TV architecture?